Amazon.com description: Product Description: How can we get the most out of our close relationships? Research in the area of personal relationships continues to grow, but most prior work has emphasized how to overcome negative aspects. 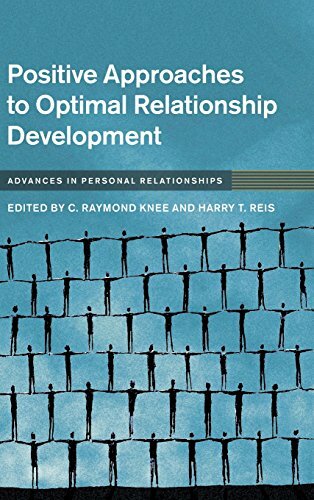 This volume demonstrates that a good relationship is more than simply the absence of a bad relationship, and that establishing and maintaining optimal relationships entails enacting a set of processes that are distinct from merely avoiding negative or harmful behaviors. Drawing on recent relationship science to explore issues such as intimacy, attachment, passion, sacrifice, and compassionate goals, the essays in this volume emphasize the positive features that allow relationships to flourish. In doing so, they integrate several theoretical perspectives, concepts, and mechanisms that produce optimal relationships. The volume also includes a section on intensive and abbreviated interventions that have been empirically validated to be effective in promoting the positive features of close relationships. About: How can we get the most out of our close relationships?